Prevention has always been a cornerstone of excellent dentistry. However, with the advancements in technology, your dentist can now take digital images to improve your preventive care. How do they improve dental care? Digital images allow your dentist and the rest of our dental team to view the inner and outer workings of the mouth. This can help to spot issues that the naked eye would not be able to distinguish. Digital x-ray images are one of the great advances in the world of dentistry. Not only are they safer for our patients by reducing radiation levels, they’re also much better for the environment and save our office from creating an unmanageable paper trail. Rather, we’re able to upload your images to your file and keep your records electronically. Digital images don’t have to be developed, and they’re instantly available for both doctor and patient to look at. X-rays are a very important tool that both you and Dr. Sandi Hamm can rely on. They allow us to see what’s going with your teeth and mouth internally, often giving us a view of what your untrained eye can’t see. This allows for a faster and more accurate diagnosis if there does happen to be a concern that arises. This further supports our conservative approach to dentistry, even though we’re using modern technology! 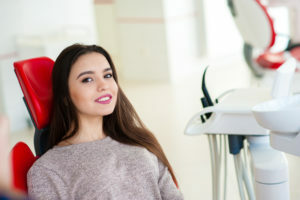 We recommend taking x-rays on all of our patients at least once per year, although if you visit your dentist semiannually as we recommend, you can get them twice a year. We may also use them to diagnose emergency situations. At Dr. Sandi Hamm’s dental practice, you’ll find that we take a different and more comprehensive approach than most dental practices. We understand that oral health is directly related to overall health, and this is a philosophy that permeates everything we do. You’ll notice state-of-the-art technology designed to give you the most comfortable and efficient treatment possible, while we help you achieve and maintain optimum oral health. We invite you to contact our office to schedule your next appointment and learn more about digital x-ray technology. We know you’ll love the difference you experience when you choose Dr. Sandi Hamm for your care!